Let’s face it… not every day’s the greatest. Sometimes you just don’t feel like doing much of anything. Wouldn’t it be nice if there was a way to change your brain waves at the push of a button? We’ve all heard about TMS — transcranial magnetic stimulation. With TMS, doctors and brain-hackers use a very strong magnetic field to instantly produce huge changes in the brain. It turns out the inverse may also be true. That means there’s a way to overclock your mind without needing blinky-light goggles or loud pulsing tones in your ears… and all it takes is a ten-minute 555 project with a relay coil (or any other electromagnet) and a potentiometer. 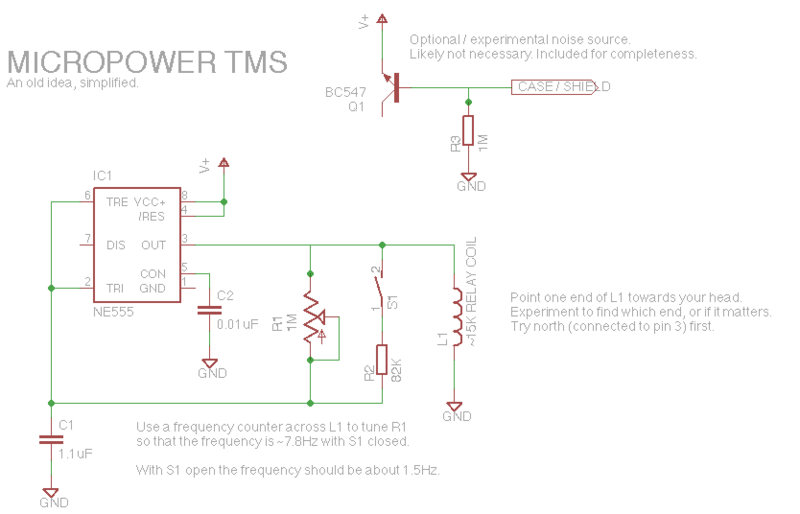 The schematic is not the usual way of wiring a 555… it’s a bit simpler. You can even leave out S1 and R2 if you only care about one setting. All it does is produce a perfectly symmetric square wave into L1, a coil wound on an iron core. Ideally L1 has a DC resistance of about 15K: the magnetic field can be incredibly weak and still produce an effect, so using a lower-resistance coil just wastes battery power. Some researchers find the brain responds best to magnetic pulses, not continuous waves. If you want a more effective version, try changing the coil! Instead of using an iron-core relay coil with the 555, get a piece of ferrite rod and wind your coil around it. Using a magnet, bias the ferrite rod just below the saturation point. This creates a “magnetic pulse compressor.” A bit too complex to explain here, the result is a magnetic pulse with a lighting-fast rise time. You can also use a few strips of Mu-Metal sheet as a core, and get even more impressive effects. Why? The Mu-Metal’s tremendous permeability makes a very strong pulse, while the material’s low saturation point creates the pulse compression effect. If you want to go even further, try making a relaxation oscillator instead of using the 555. You can do this with a single unijunction or programmable unijunction transistor and a tiny handful of external components. Set up the relaxation oscillator so it dumps its charge through the coil around the core. This will produce a “flyback” effect once the transistor turns off again… an incredibly fast-rising (but still very low power) magnetic pulse around the coil.